About 35 percent of people break their New Year’s resolutions by the end of January, according to a survey by Franklin Covey, a maker of day planners and personal organizers. If yours is to get in shape, here are some tech gadgets that can help you stay on track. The most basic and common fitness technology product is a pedometer. Generally worn in the hip area, it detects body movement and counts how many steps you take. Most devices have a simple restart counter button, and some automatically reset at midnight. Health experts agree most adults should take an average of 10,000 steps every day, which calculates to about five miles, depending on your stride. aerobic steps. 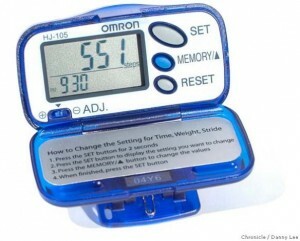 Pedometers generally range in price from $10 for a basic device to $50 for one with multiple features. Omron is one of the more popular brands, and it offers a variety of devices in the $15 to $30 range. Pedometers are a great option if you don’t want to spend a lot of money, but you’re looking for a basic tool to help you stay motivated. The downside to pedometers is that they are not always completely accurate. If you ride a bicycle or do a workout video, for example, your activity might not be recorded. Pedometers also don’t provide personalized calorie burn information, only estimates based on counted steps. If you’d prefer to know exactly how many calories your body is burning at all times (and therefore how much food you should eat – or not – to achieve your goals), then try the BodyBugg. “BodyBugg allows you to … develop realistic goals based on your current lifestyle parameters,” said Lead BodyBugg Coach Kim Slover. This little device straps to your arm and uses four sensors to provide accurate calorie expenditure estimates. The sensors measure body motion, how much heat your body is radiating, skin conductivity and your body’s core temperature. Upload your calories burned to the BodyBugg Web site along with food you’ve consumed and you are left with a simple equation: Burn more calories than you eat and you’ll lose weight. There are about 3,500 calories in a pound of body fat. “It allows you to make choices, not sacrifices,” said Slover. The BodyBugg is great for the math nerd who loves equations and whose main goal is to lose weight. Downsides are that it only works on a PC and some ethnic foods are hard to find in the database (although you can upload your own recipes or nutrition facts). Retailing at $399 for the armband, a three-month subscription to the site and one to two phone-coaching sessions, the price is the biggest disadvantage. Swirl, launched last month, is one of the newest fitness tech devices on the market and retails for $149, including three months of Web service. “The Swirl lets you pick your favorite music and intensity – match it to a heart rate zone workout that you create,” said David Rothenberg, director of marketing for Swirlnet, the parent company for the Swirlfit Web service and the Swirl device. The Swirl puts heart rate data into context with a coach right in your ear telling you to work harder or relax a bit based on real-time feedback. At first, the voice talking over your music is somewhat odd, but it actually is quite motivating while working out. about nine workouts. You can also put your workouts on your iPod, but then you miss out on the real-time heart rate data. The disadvantage for this device is that it’s so new that some of the bugs are still being worked out and it, too, can be used only on a PC. Polar offers a variety of fitness watches, many with a heart rate monitor and some with personalized workout programs and calorie counters. The devices come in an array of colors (including pinks, blues and greens) at prices from $70 on up. The Polar F11 watch, which retails for $179.95, is a good tool to help you lose weight. You can set your heart rate zone and see a bar graph of your real-time data while you are working out. The problem is that most people don’t have the context for heart rate information during exercise and so it doesn’t do them much good until they’ve uploaded their data. The F11 also has great features that act as your personal trainer, but it can be hard to read the small screen during your exercise, and it’s not as easy to use out of the box as some of the other devices. Polar also offers higher-tech devices for more elite athletes. How many calories do you really burn exercising? This reporter put these devices to the test during a 35-minute workout on an elliptical machine. The results show that a simple pedometer might not be as reliable in this area as devices that monitor your heart rate. Article published on the front page of The San Fransisco Chronicle’s Business and Technology section on January 14, 2008. Here’s the link to the original article.